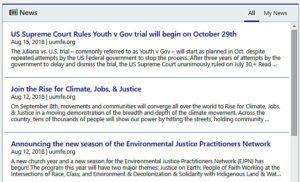 The Navigation Menu can be found on the left-side of every page in the Create Climate Justice Net (CCJnet) user portal. You can collapse and open the Navigation Menu by clicking the icon of three horizontal lines in the upper left corner of the website, next to the “Create Climate Justice” icon (see picture below). The Dashboard is your personal home page on Create Climate Justice Net (CCJnet). It is the first page that you see when you log-in to CCJnet, and you can go to it at any time by clicking on the Dashboard link in the Navigation Menu or clicking on the “Create Climate Justice” icon in the upper left of the page. The Dashboard has three main fields of content: News, Events and My Groups. The News section appears on the upper left of your dashboard. Public resources and events from groups can be posted onto the News feed, and content from the Unitarian Universalist Ministry for Earth’s blog also publishes on to the News feed. At the top right of the News section, you may select to see either “All” news or just “My News”. “My News” shows only items that are paired with the interest tags that you selected in your personal profile settings. Currently, CCJnet users can only post events and resources to the News feed, and they must do so from a Group page. A group moderator must review and approve the post before it is published. You may be wondering (1) why only events and resources? &/or (2) why do I have to post something through a group? In short, the answer is that CCJnet is designed for community organizing and mobilization. Sharing information about events and resources that people can engage with has a greater movement building impact, which is why these things are given visibility in the News feed. It makes more sense to share news and commentary through conversations in groups that you participate in, and to shake the habit of sharing news and commentary just to vent and share news. Focus on learning and sharing wisdom & resources, focus on deepening the strength of your relationships, and focus on supporting community organizing efforts for climate and environmental justice. Visit the Knowledge Base pages about creating an event or sharing a resource for more information about how to post events and resources to the News feed. The Events section appears on the upper right of your Dashboard. At the top right you may select to view either “Featured” events or events you have marked that you are “Attending,” via the RSVP function of the specific events pages. Events are created on Group pages, where they are marked as either private for the group or public for the entire network. NOTE: You can access the full searchable Events page from the Navigation Menu. Below the Events field on the Dashboard is your personal My Groups list. This section serves as a space for quick links to get to the pages for groups you are participating in. Groups are the most foundational component of using CCJnet; groups are where the conversations between members take place, where events are created, and where resources are uploaded. NOTE: You can access the full Groups page and group search feature by clicking “Groups” in the Navigation Menu.